Several months ago while playing in the park across the street Gabriel and I watched a mobile restaurant set up shop. Because of the American population present in the area the owner flew up an English speaking friend from down south for opening weekend. Said gal approached me at the park the day before opening and told me all about The Oyster House. The Oyster House is a restaurant where you grill all your own food! The majority of the food is obviously seafood but they do have some pork, beef, and vegetables. Though neither of us are huge oyster fans we figured it would be a fun experience and naturally waited until the end of their temporary stay to check it out! When you enter the trailer you pick up a tray and grab the raw food you're going to cook. We picked a basket of oysters, corn and pork. I totally spaced on the scallops! You're given some tongs, heat gloves, and a prying knife. The instructions for cooking were of course in Japanese but we were hooked up with an English speaking server who explained it all to us. 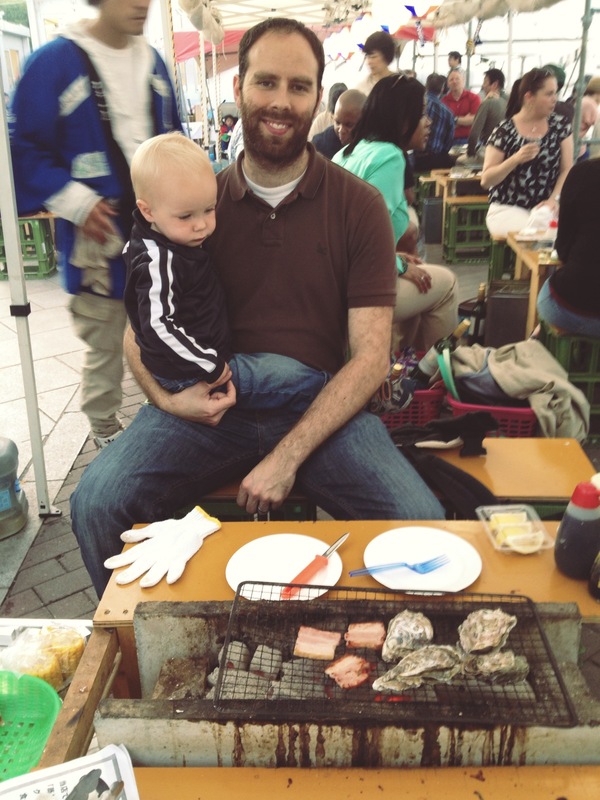 This was Gabriel's first time trying corn on the cob and oysters! I wasn't surprised that he like the corn on the cob- it tasted like kettle corn. However we were blown away that he actually LOVED the oysters! It was a fun night and an experience we're glad we went for. Chris has only had oysters one other time- they were raw at Anthony's and he didn't care for them at all! Oyster House redeemed oysters for Christopher. As always my favorite part about going out was watching Gabriel charm others in the place. He has a knack for snagging the attention of other Japanese kids and adults alike- he loves it, they love it and everyone has a grand time! Your little one has a much more sophisticated pallet than I do! What a cool looking place! Thanks. We always hope for better (poor kid has such high expectations on him) but we never hesitate on taking him out- he's a great boy. His first solid was grilled salmon! We weren't even ready to give him solids yet but he insisted and ate the whole thing. He loves his variety of food!